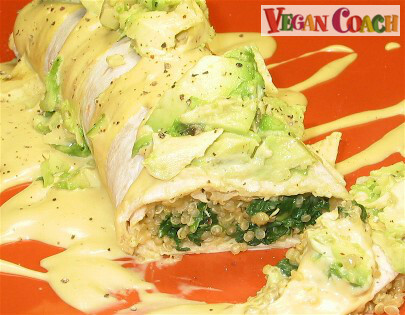 Learn how to make a sauce with healthy vegan ingredients. Here we use a base of cashews. Then we'll build the flavors based on your exact tastes. Fun! If you've been hanging with me for a while, you know I'm a HUGE fan of vegan sauces. A local paper once wrote an article about me and they called it Saucy Sassy. It's important to learn how to make easy sauces from scratch for many reasons. First off, the sauce can be changed up each and every time. And very easily at that. I'm going to show you how to build a sauce from scratch, and why I chose the ingredients I did. 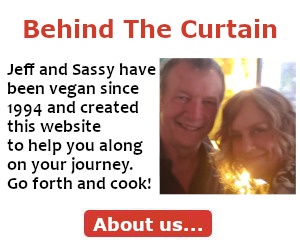 This will give you a basic idea that you can build on to create your own vegan sauces. There are MANY foods you can use as a base for your sauce. One of my old standby faves is cashews. Why? Because they're a healthy fat that you need, and they whip into a very smooth and creamy sauce. My next step is to add ingredients that will balance the flavor of the sauce. These are sweet, sour, bitter, spicy/pungent and salty. But before you go there, check out the flavors that will match with your finished dish. Since I was making a Quinoa and Spinach Wrap, I looked over the Spinach Flavor Matches, but I could have also zeroed in on the Quinoa Flavor Matches and the results would have been just as fantastic. Just choose one main ingredient from your finished dish to focus on, as this will be sufficient. What are "Vegan Flavor Matches"? A list of ingredients that match with your chosen food perfectly. This helps you to whip up vegan dishes and sauces on-the-fly using what you have in your cupboard at any given time. SOOOOO EASY! So, armed with my Spinach Flavor Matches, and keeping flavor balancing (sweet, sour, bitter, spicy/pungent, salty) in mind, here's how my sauce came together. SOUR - I like to add a foodie acid, such as lemon juice or apple cider vinegar. But scour your cupboards for other ideas, such as sauerkraut juice, for instance. BITTER - Freshly ground black pepper is always a good bitter ingredient that most people have on hand. SALTY - I used sea salt here, but you can use Tamari, soy sauce, miso -- any ingredient with an overriding salty taste. And to add a little zip, I added some green olives since olives are a great match for spinach too. And upon noticing that horseradish is a flavor that matches well with spinach, I tossed some into my sauce to "up" the spicy side of things. Some nutritional yeast really helps it to have more of a "cheesy" flavor. And then water is added at the end until I was happy with the thickness -- it should be thin enough to pour, yet thick enough to give it a rich, yummy mouth feel. Sea salt and pepper finish it off. Of course, you're going to taste your sauce as you go along. Then, at the end give it another taste -- does it need anything? More sweetener? More of a sour taste? Always remember, there's no right or wrong way to do this. Just follow these few simple ideas with a big dose of intuition and you'll find success. Add all ingredients to a blender, and process until completely smooth. Hope you've found this primer on how to quickly and easily make a vegan sauce helpful. As you can see, you don't need a recipe, just a couple tools to help you along. 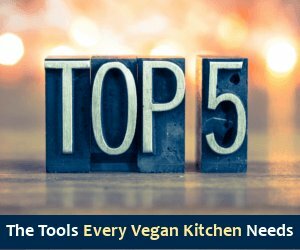 Be sure to visit the Vegan Cooking article for a list of main ingredients (veggies, grains, beans, fruits) that contain the Flavor Matches you'll need to assist you in your sauce creation. And be sure to check out Get Sauced With Sass! 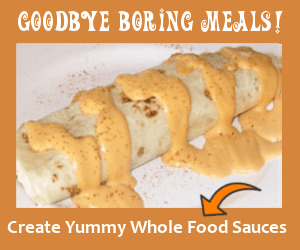 which teaches you how to create homemade rich and creamy sauces without recipes. When you learn how to use the ingredients you have on hand to make a sauce any time you want or need one—in minutes!—your meals will never be boring again. p.s. Some people wonder how you know which ingredients fall into the sweet, salty, bitter, spicy/pungent and sour categories? Understandable, of course! When you're cooking freestyle, these are important skills you need to get under your belt. And this is a perfect example of the type of thing we teach in our cooking courses. 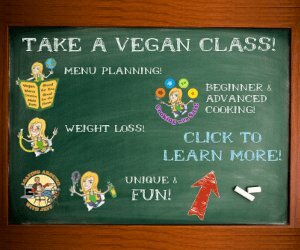 For you, I recommend our class Vegan FUNdamentals if you're fairly new to the vegan diet, and Cooking With Sass! 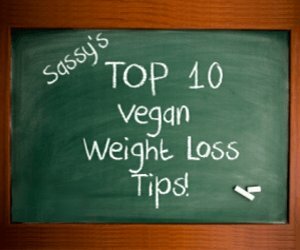 for our more advanced students who've been vegan for a while. "I am in love with your website! I have been searching through the internet for some time, and finally have found what I consider an ideal vegan site. I just finished a course for vegan cooking at Country Life, Prague, in the Lifestyle Institute. Thank you! I appreciate your work!"